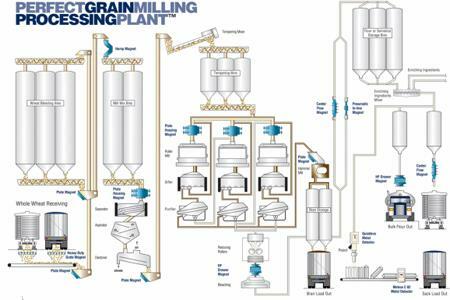 A plant flow sheet illustrating the ideal location for Magnetic Separators and Metal Detectors to remove metal contamination from Grain and Cereals. By the time grain and cereals have been collected and delivered to a Milling Plant, it is highly likely that there is metal contamination present. Removing that metal to prevent damage to processing equipment and to produce the highest quality end-product is essential and achieved with a series of different designs of Magnetic Separators and Metal Detectors. MORE FROM Bunting Magnetics Co.